Once a while I am curious about special offers of food chains as Rewe or Aldi; then I buy a bottle or two, just to try. To avoid any misunderstanding right away: I am not a dogmatic detractor of Aldi. Rather in the opposite, I think Aldi offers varieties of good stuff for reasonable prices. Among other special offers of Aldi there was a Chablis of Etienne Rodier some time ago. Chablis is usually characterful wine made out of Chardonnay grapes. Actually Chablis stays for many people rather for hefty and rich wines. 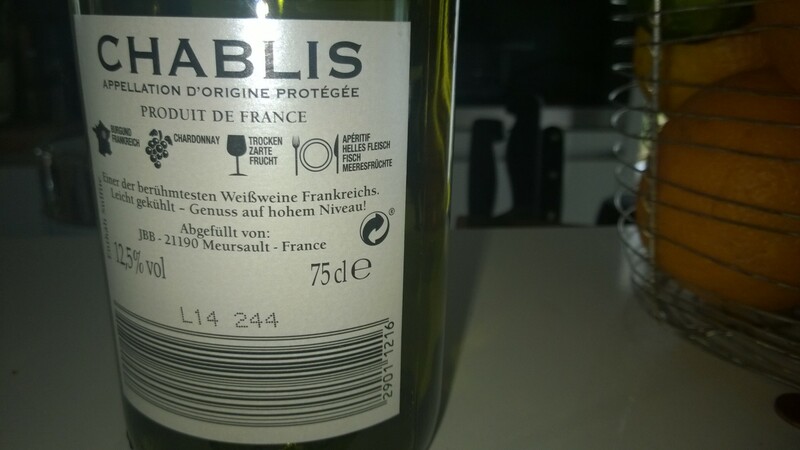 Though this Chablis is a ridiculous experience: presented as something unique and price wise somewhere between seven and eight Euro, this wine is poor. It is not only very light but indeed flat and boring. It has no character, there is no interesting flavor, nothing extraordinary. In the light of the very poor taste the price is brazenly. Considering how delicious many wines of Burgundy can be – even for affordable fees – this is not the case for Chablis of Etienne Rodier.